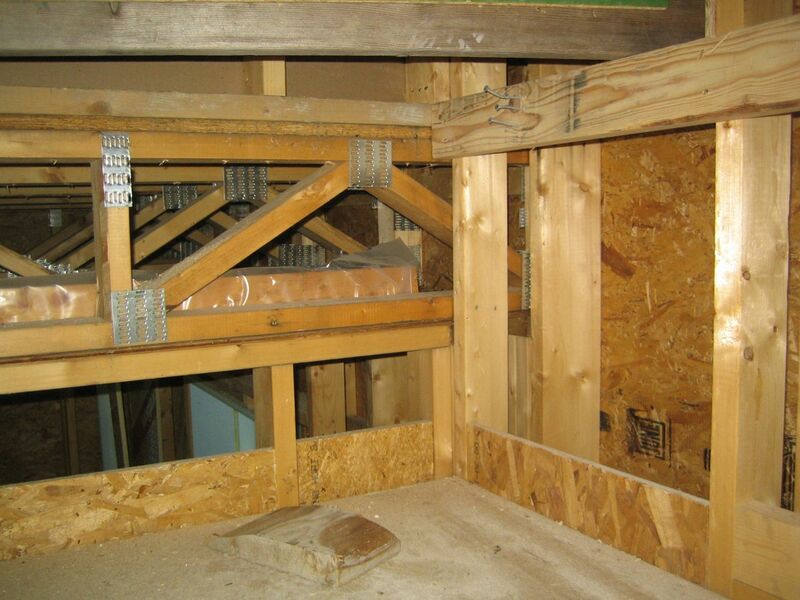 Problem area: Stair well and at 2nd floor trusses. Gasket at ceiling. 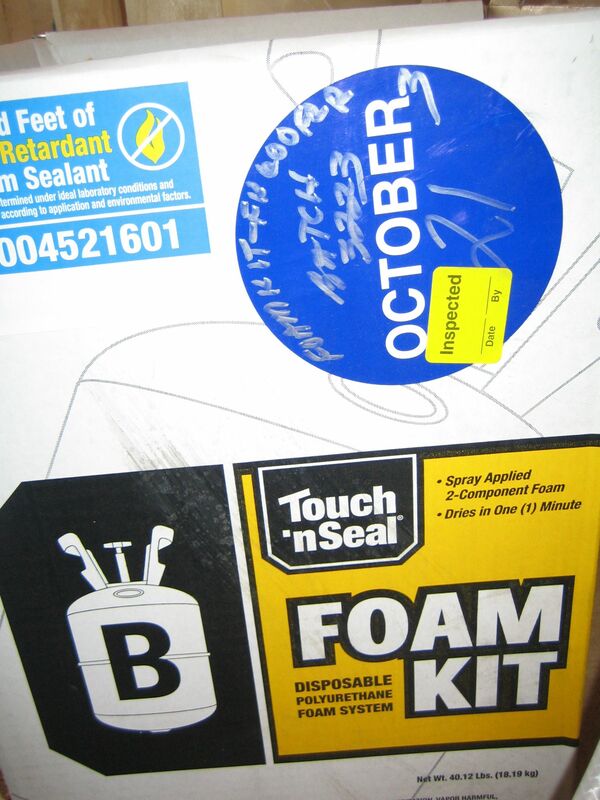 Also shows foam to seal penetrations through top stud plates. Intersection of exterior (left) and interior (right) walls. Gasket around top of ceiling and at exterior walls. 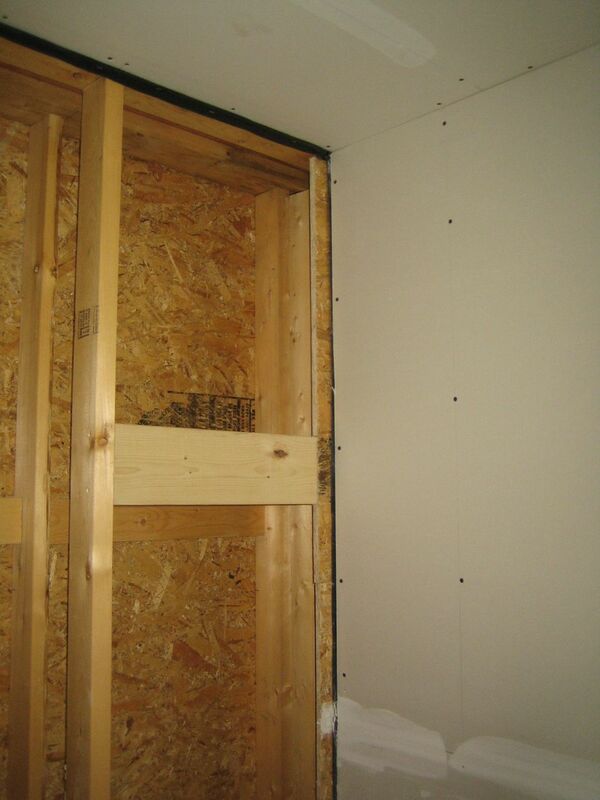 Thought I would share a few more sheetrock progress photos. The entire second floor ceiling is now sheetrocked and taped. This means we’re ready to foam the intersection of the walls with the ceiling, from the attic side. 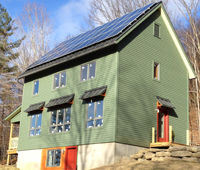 Then we just have to install the east door before we’re ready for the blower door test, sometime in the next week or two. In the meantime I’ve been stapling gaskets to the exterior walls on the 2nd floor. Our primary air seal is at the exterior of the shell, but we’re also trying to seal the interior shell to prevent any warm moist air from circulating near the cellulose. 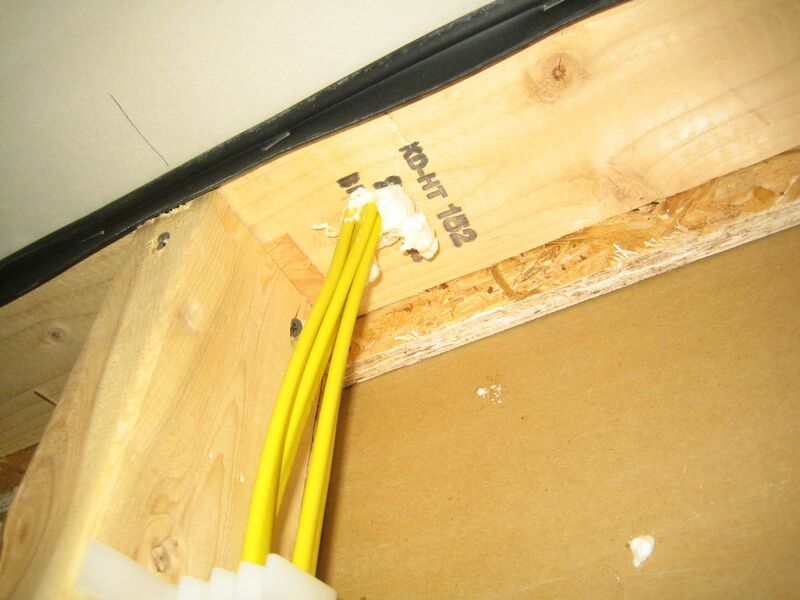 The gaskets are important in 3 areas, ceiling, floor and at the intersections with interior walls. 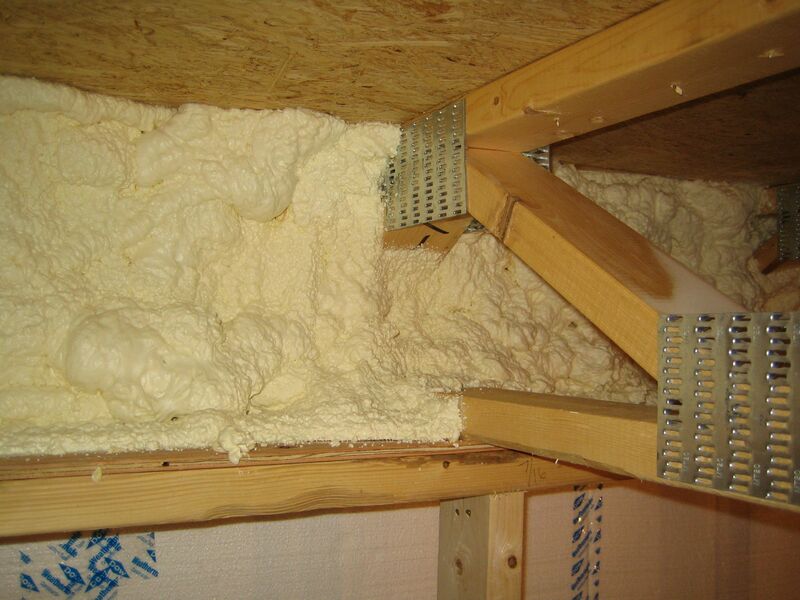 Ceiling: The ceiling gasket is redundant with the foam that will be applied from the attic space. Basically, I don’t trust the foam or the gasket on their own, but I’m hoping both together will catch any spots we miss. Bottom: The gasket at the bottom of the wall, together with the gasket under the wall that we installed during framing, keeps interior air from entering the exterior wall space at the intersection with the floor. 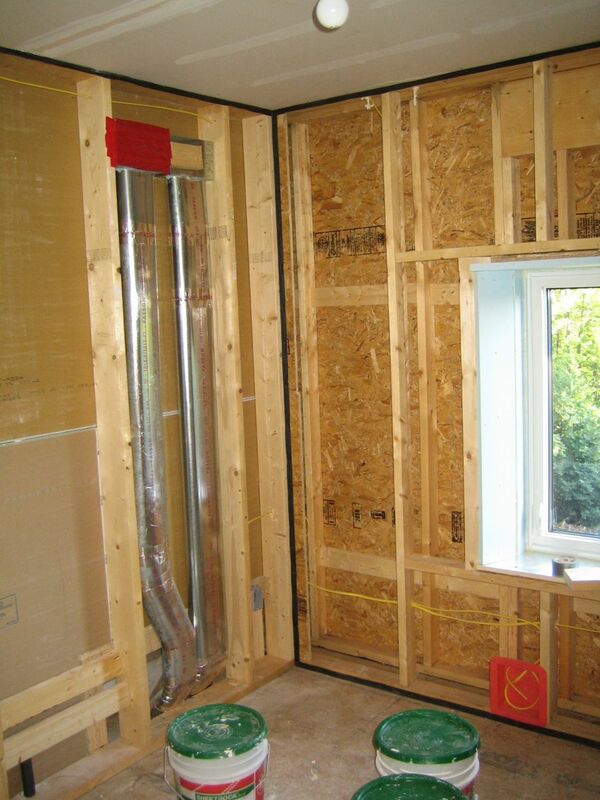 Intersection with interior walls: The vertical gasket at the intersection with interior walls keeps interior air from slipping into the exterior wall through the corner stud. The stairwell is adjacent to the north exterior wall and penetrates the floor planes to pass from the basement to the first and second floors. 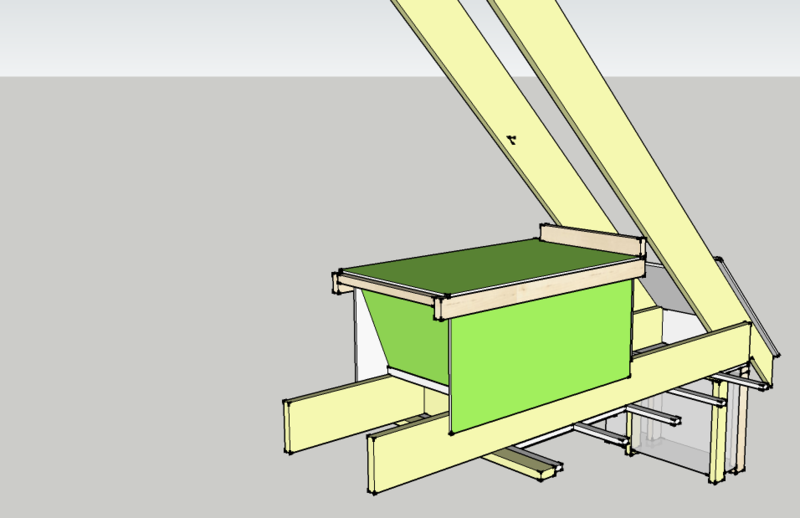 Following the approach described above, I should run gaskets around the exterior wall and at the ceiling and floor, but what about the truss area between the 1st and second floors? 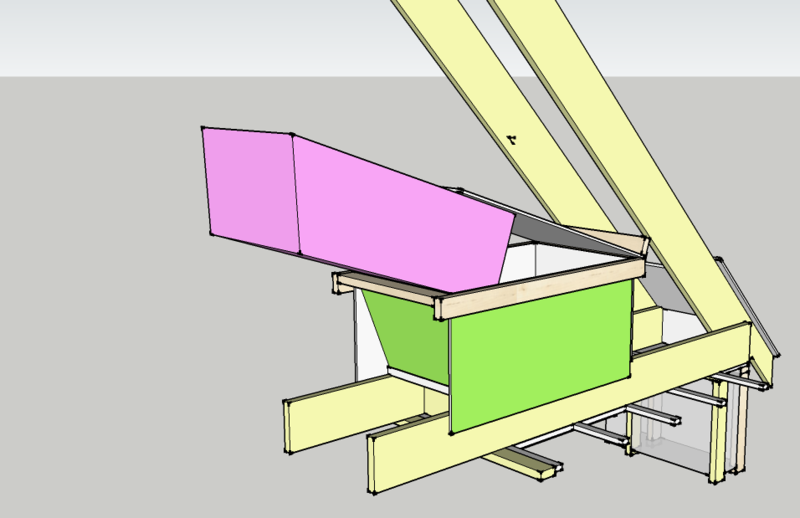 The ceiling over the 1st floor is open all the way to the exterior sheathing, and to the exterior wall behind the stair. 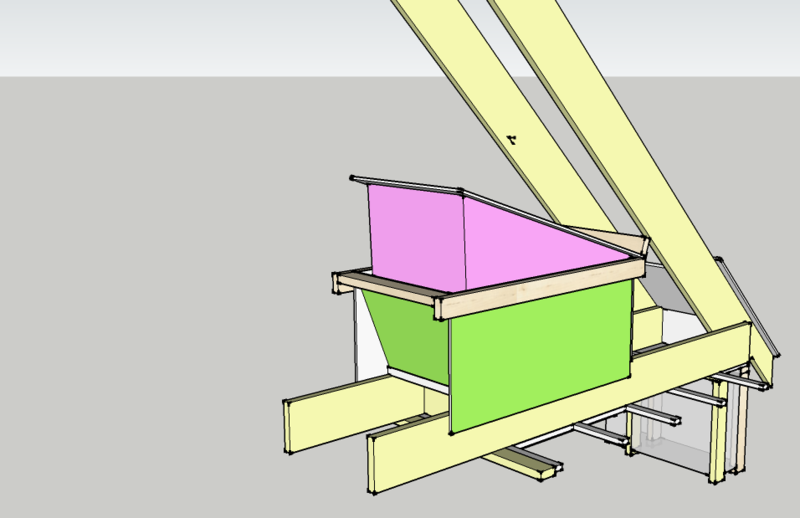 I think we’re going to need to block the area at the trusses, so air from the 1st floor ceiling can’t pass into the exterior wall behind the stair. It’s little details like this that are rarely documented in most air sealing guides (because they are less typical) and easy to miss. I’ve been going back over all our details to make doubly sure we haven’t missed something silly. Well, at least for the 2nd floor ceiling. 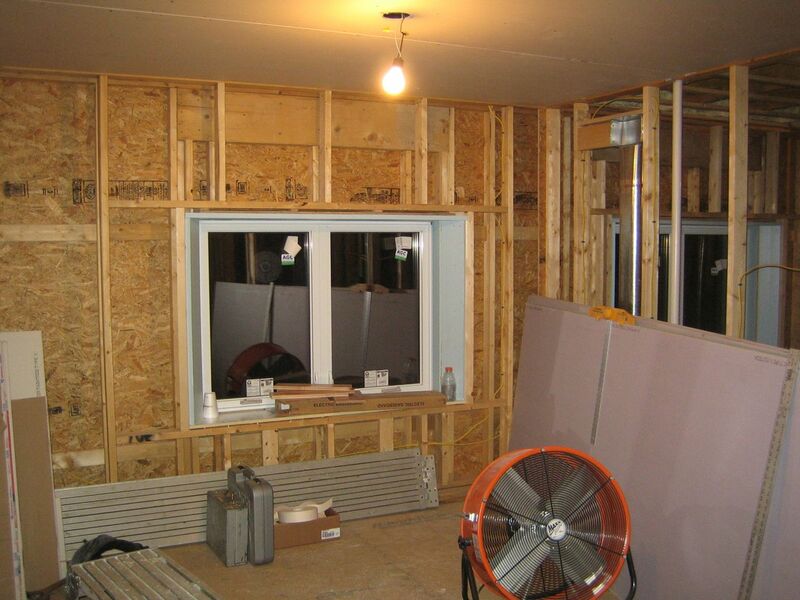 Normally, you wouldn’t start the sheetrock till the walls are insulated. But in order to test how well (or poorly) we’ve sealed the house with a blower door test, we need to complete the air barrier, and that means the 2nd floor ceiling. 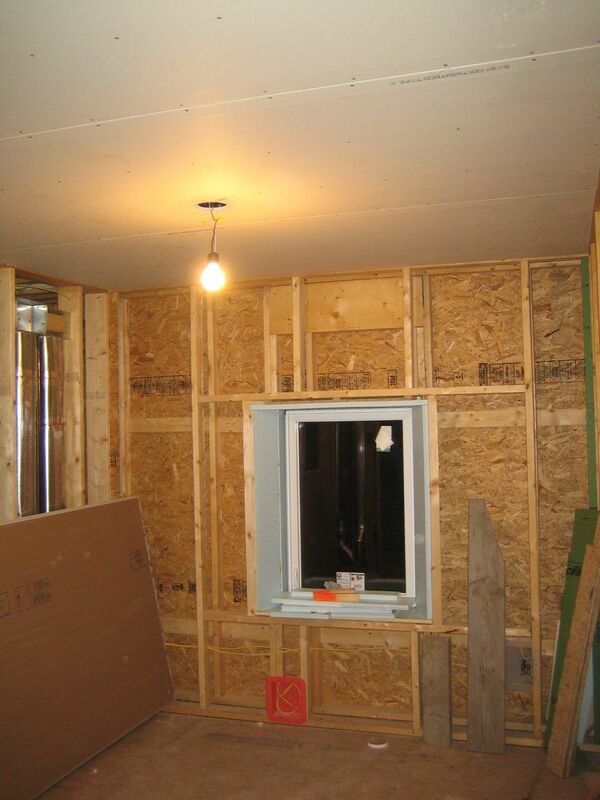 This is the area where the air barrier transitions from the exterior of the house to the interior. It will be one of the trickiest areas to seal properly. We installed gaskets around the top edges of the walls, but because we’re using strapping, it made it difficult to close all the gaps. So we’ve decided to use 2-part foam only around the edges where the ceiling meets the walls. This should ensure that we have all possible gaps sealed. We used poly boxes at all exterior wall electrical box penetrations, but we totally forgot to do this at the 2nd floor ceiling. 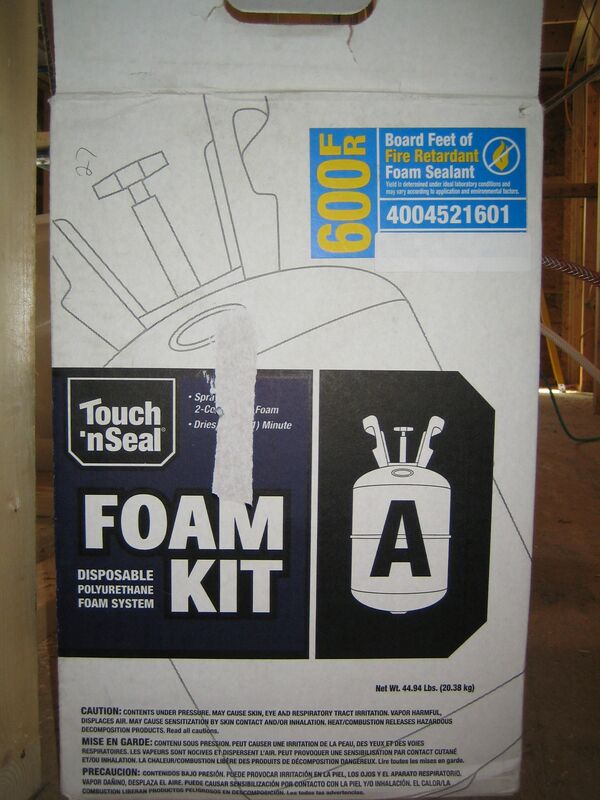 We’ll have to use a combination of tape and foam to seal light fixture electric boxes in the ceiling. 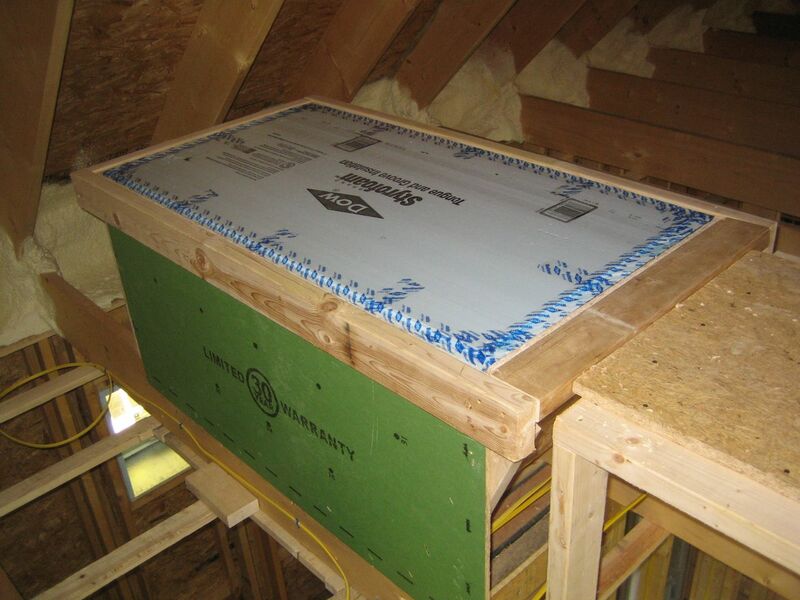 I think I’ve mentioned in an earlier post that a smarter way to air seal the top of the enclosure would have been to extend the exterior sheathing and air barrier over the ceiling joists. 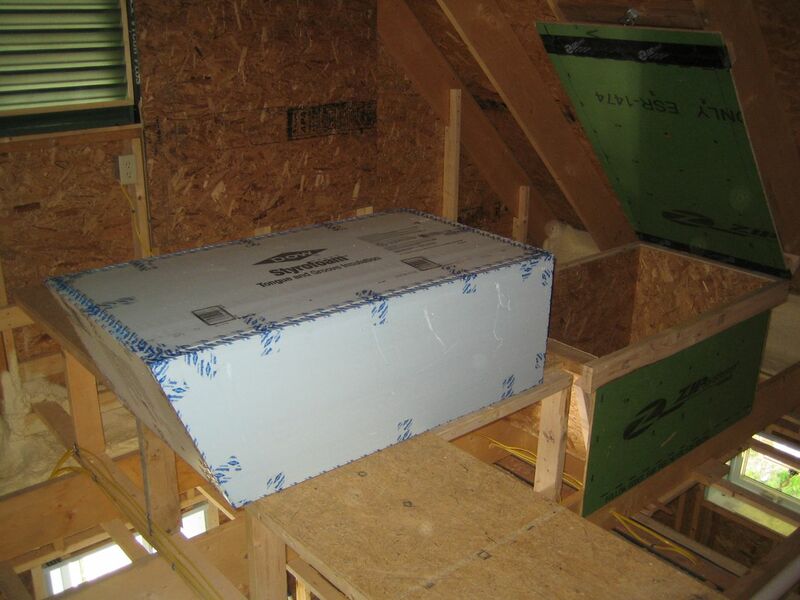 Then pile the roof insulation on top of the sheathing. 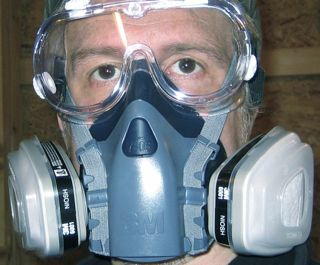 This method has been used by Marc Rosenbaum, although the air barrier in this case was the roof. 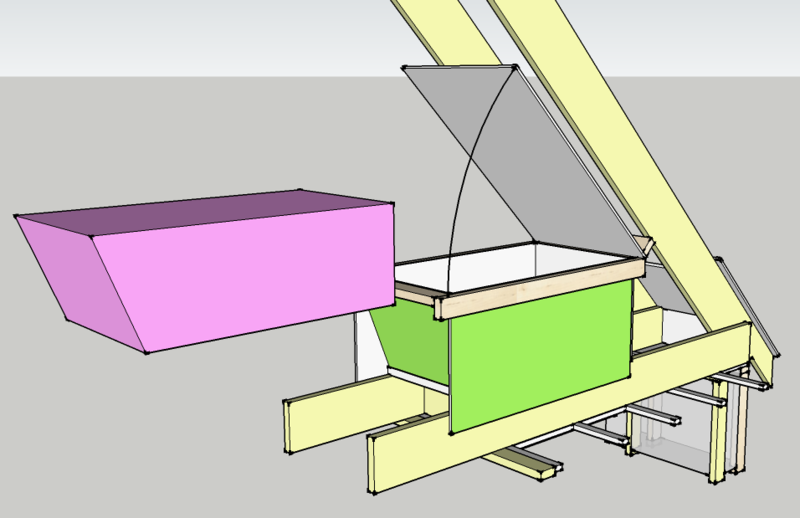 * This approach would necessitate raising the roof up a bit to ensure proper insulation levels at the eves. 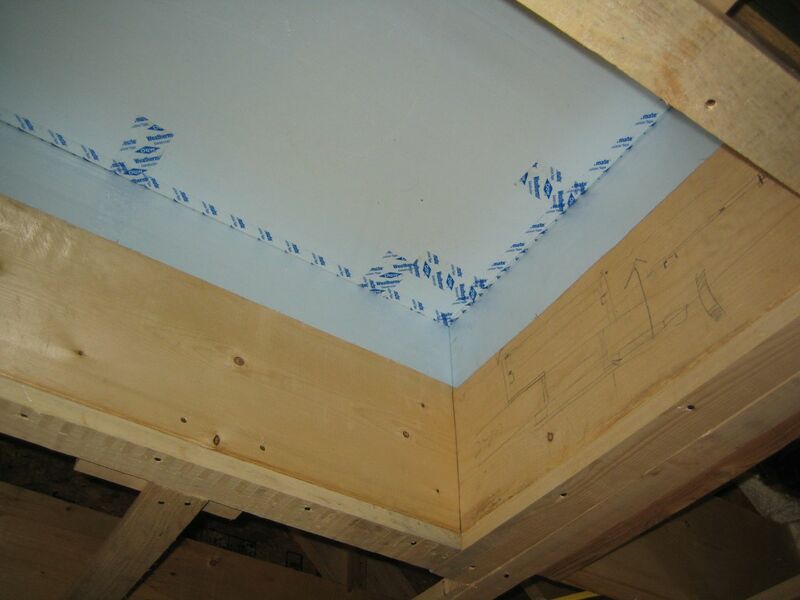 The extra expense of sheathing the top of the ceiling joists would have likely been offset by the extra labor and material costs spent sealing all the gaps with foam.